Over 700,000 new jobs. Check. Americans spending money? No way. People in the U.S. spent less in April than they did in March, according to the latest data from the Commerce Department. It's hardly a new trend. Americans have been hesitant to buy much at the store or elsewhere for months. Instead, they have been increasing their savings. The annual savings rate, now 5.6%, is higher than it was a year ago, and significantly higher than the pre-recession norm of around 3%, according to the Federal Reserve. "Americans barely pried open their wallets in April," Jennifer Lee, senior economist at BMO Capital Markets, wrote in a note to clients. That's important because American spenders make up the majority -- about 70% -- of economic activity in the country. If people don't spend, the economy doesn't grow. Turnaround ahead? Economist expected to see some uptick in spending this spring now that more people have jobs, and they have been saving money from cheap gas prices. But the latest yardsticks show Americans still aren't confident to spend whatever money they are saving from months of low gas prices. A gallon of gas was $3.66 a year ago. Now it's $2.74, according to AAA. 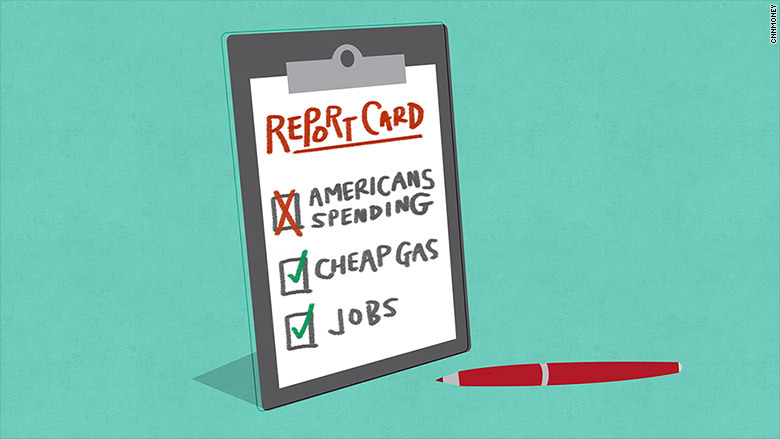 The spending numbers also indicate Americans' lack of confidence about the economy's future. People don't spend if they sense stormy skies ahead. The personal consumption and savings figures kick off an important month for the U.S. economy. A key manufacturing barometer -- the ISM -- showed modest improvement Monday, but it's still at a level that is more consistent with 2% economic growth versus the 2.5% to 3% everyone wants to see this year, according to Capital Economics. An even more important look at the economy will happen on Friday when the Labor Department reveals how many American jobs were added in May. Hiring dipped in March, so economists and policymakers are looking for a strong spring pickup. Keep a close eye on wage growth, the absent ingredient in economy's recovery. Tepid wage growth is a central reason why some Americans aren't spending. If they don't feel any better off now about their household finances, they aren't going to buy more. Later this month, the Federal Reserve holds a critical meeting where it's not expected to raise interest rates. Many experts believe the Fed will raise rates at its meeting in September. A rate hike, which hasn't happened since 2006, would be a healthy sign for the economy. There are some signs that the economy is gaining steam this spring after a sluggish winter. But Monday's spending numbers are another set back of America's economy.